The following publications and presentations I have written and given wrt. the topic OpenStreetMap. They are provided under the CC by SA 3.0 license, if not specified otherwise. Holger Schöner, "Karten im Druck" (German, slides, article), FOSSGIS 2010, 05.03.2010. Holger Schöner, " The Dream of Your Own Map" (slides), Linux Woche Linz 2009 (LIWOLI09), 25.04.2009. The following is a list of example renderings produced by me. They are usually produced using the mapnik rendering engine. As they all derive from OpenStreetMap data, they are provided under the CC by SA 2.0 license (the older ones as required, and the newer ones since introduction of ODbL for OSM data I also provide under this license). A click on an image allows to view or download the image in its original size; some of the images are rendered in a different resolution for the thumbnail below, and so may show less detail than the original. New 2013 version of Gutau map. 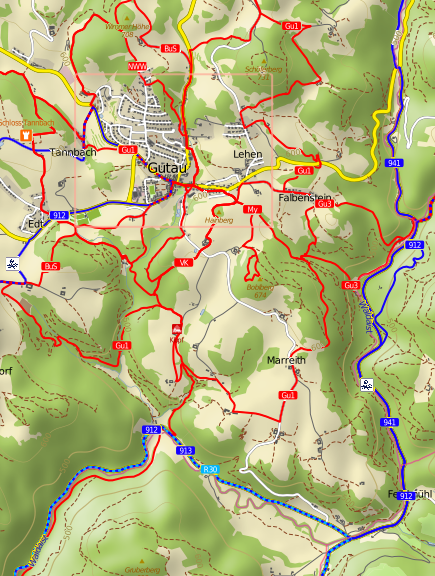 Uses new style (advanced text rendering), contains hiking and biking routes and additionally POIs regarding ebike rental and charging. Following the ideas and techniques used by Toposm and presented at the wiki page TopOSM, I am continuing to develop my topographic rendering style. A current (January 2011) snapshot is shown at the left. The style is still incomplete wrt. layering of roads, and railways, buildings, points of interests, etc. are still missing. This is an example of a map whose up direction is not exactly aligned with the north direction. 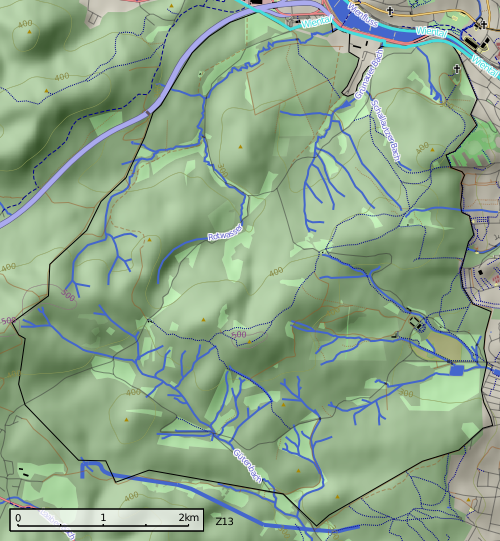 Such maps can be useful, if the course of a cycling or hiking route or a river should be shown without showing too much unrelated area (which could occupy a lot of space). 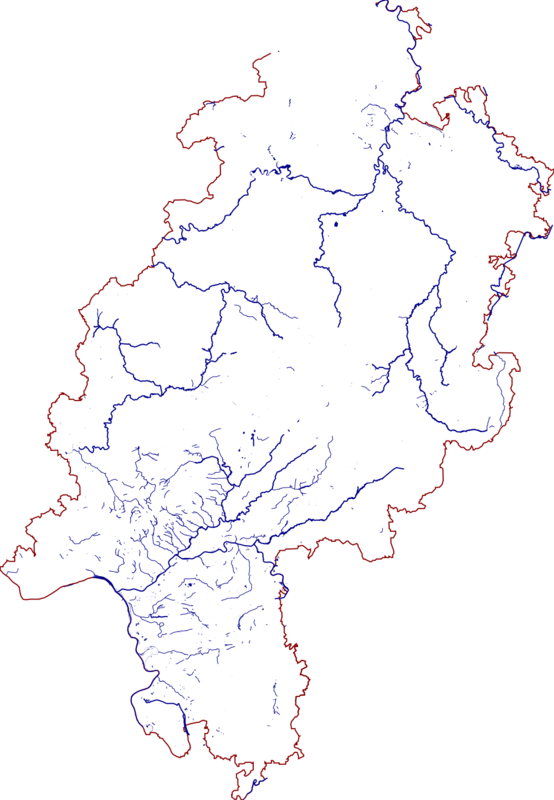 A series of maps oriented such, that each shows a certain part of the route or river aligned to the horizontal or vertical image axis, can be a solution to this, and is used in several guide maps. Further examples and technical details are available in a subpage. 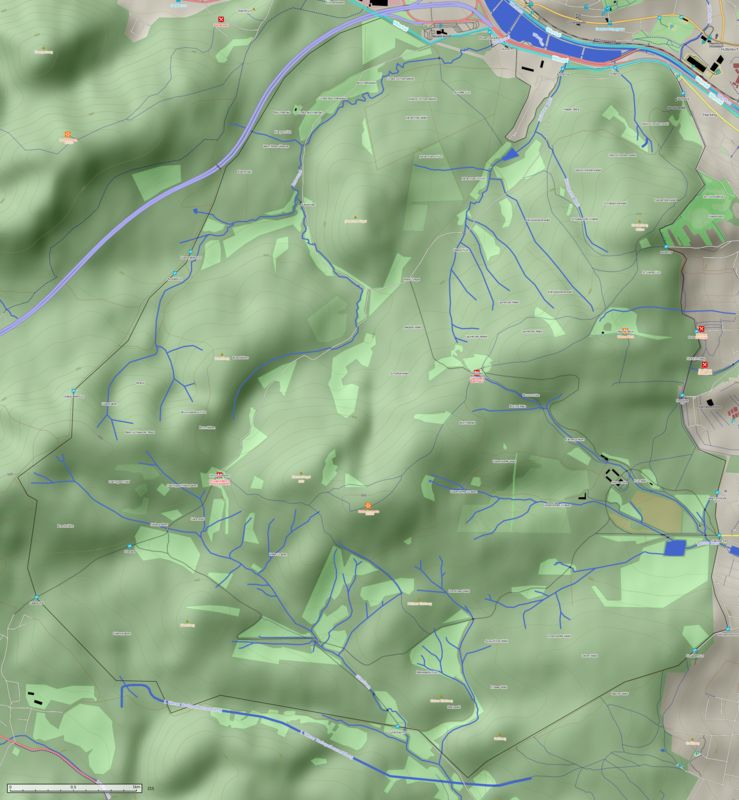 This image documents the progress of the creation of a hiking map for the Austrian Gemeinde Gutau. In its final version, it should contain all of the official hiking routes of Gutau with their symbols and colored individually, and hill shading as well as contour lines. The thumbnail is linked to a larger Version (2000px wide, 4,7MB). Further details are available in a subpage. 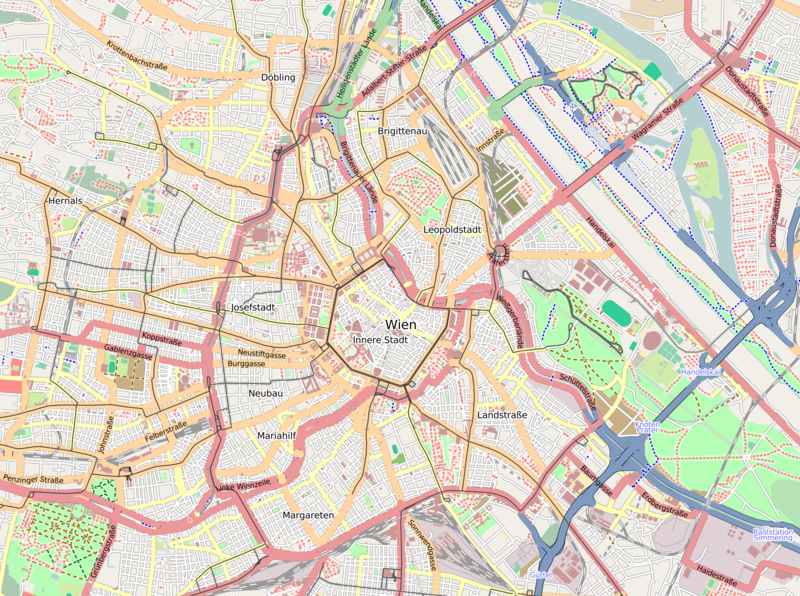 A map of Vienna generated with the standard OpenStreetMap Mapnik style is shown on the left (klicking on it downloads it). Another version shows exactly the same region, but with quadruple the size (in each direction), and all sizes (fonts, line widths, etc.) scaled by 4, and the max and min scale denominators divided by 4. This should be appropriate for a printing resolution of about 300dpi (as the original style was developed for screen display with about 72dpi[?]). The Mapnik xml style file is also available, generated by my ruby script scalestyle.rb (in Ruby, for the "old" mapnik1 styles, not tested thoroughly, but here it seems to work). Caveat: Obviously the symbols are not scaled with the rest of the file, so to really make this work, scaled symbols should also be available (maybe automatically generated by ImageMagick "convert"?) and incorporated into the style. A map of Hessen generated using mapnik with some simple cascadenic rules. An example for a quick customized rendering.